Does it make sense to understand the prehistory, history and present-day patterns of life in Southeast Asia in terms of a distinction between two ways of life: "farming" and "foraging"? 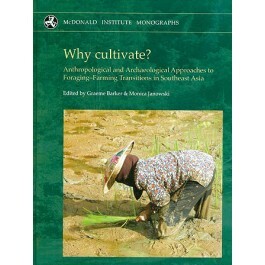 This is the central question addressed by the anthropologists and archaeologists contributing to this volume. Inherent within the question "Why Cultivate?" are people's relationships with the physical world: are they primarily to do with subsistence and economics or with social and/or cultural forces? The answers given by the contributors are complex. On a practical level they argue that there is a continuum rather than a sharp break between different levels of management of the environment, but rice-growing usually represents a profound break in people's relations to their cultural and symbolic landscapes. An associated point made by the archaeologists is that the "deep histories" of foraging-farming lifeways that are emerging in this region sit uncomfortably with the theory that foraging was replaced by farming in the mid Holocene as a result of a migration of Austronesian-speaking Neolithic farmers from southern China and Taiwan.